In December 2016, a salvage excavation was conducted at Ha-Gedudim Street in Beʼer Sheva‘ (Permit No. A-7877; map ref. 179376/571653; Fig. 1), prior to the construction of a park. The excavation, undertaken on behalf of the Israel Antiquities Authority and financed by the Beʼer Sheva‘ Municipality, was directed by N.D. Michael (field photography), with the assistance of I. Peretz and A. Rasiuk (inspection), M. Kahan (surveying and drafting) and S. Talis and Y. Abadi-Reiss. Four excavation squares were opened (c. 75 sq m; Fig. 2) exposing a Byzantine-period cist grave, dressed limestones and Byzantine pottery. 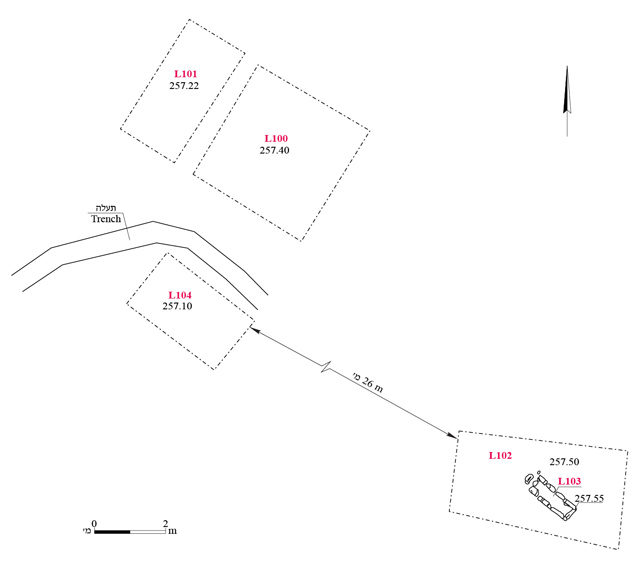 Previous excavations in the vicinity revealed graves from the Byzantine period (Gilead and Fabian 2008:318, 324–325; Abadi-Reiss and Eisenberg-Degen 2013; Fig. 3). These graves are part of a belt of cemeteries that surrounded the city center of Beʼer Sheva‘ in the Byzantine period. The cist grave (L103; 0.5–0.6 × 1.9 m; Fig. 4) was exposed 0.2–0.3 m below the surface in the southeastern square. The grave was not excavated and remained in situ. It was constructed southeast–northwest using dressed limestone slabs sunk into the loess soil. The grave was covered with slabs of dressed limestones, which were damaged and partially removed during the construction work. No datable finds were found in the direct vicinity of the grave. 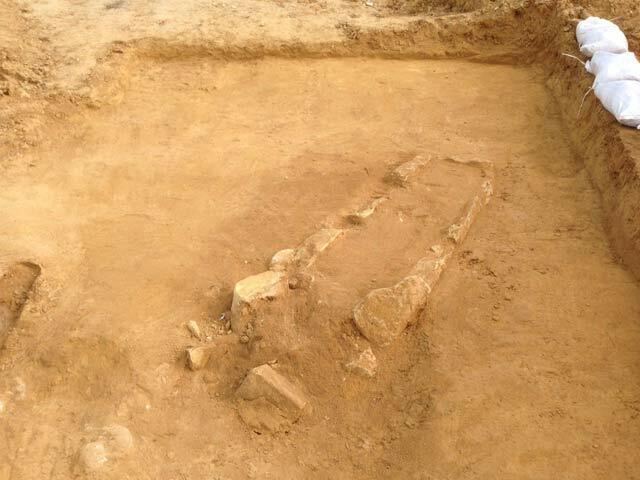 Most Byzantine cist graves found in Beʼer Sheva‘ were oriented east–west, with the head on the west side; only a few exceptions, of graves oriented in a southeast–northwest direction, such as the grave found in this excavation, have been recorded (Nagar and Sonntag 2008:83–84). The three northwestern squares (L100, L101, L104) were opened in an area that was damaged by construction work in the past, when a trench was dug mechanically, revealing dressed limestones and a large amount of Byzantine pottery. However, no ancient remains survived in situ. It is possible that the finds discovered in these squares were pushed into the area by previous construction work, possibly in the 1970s, when an underground bunker was built nearby. 3. 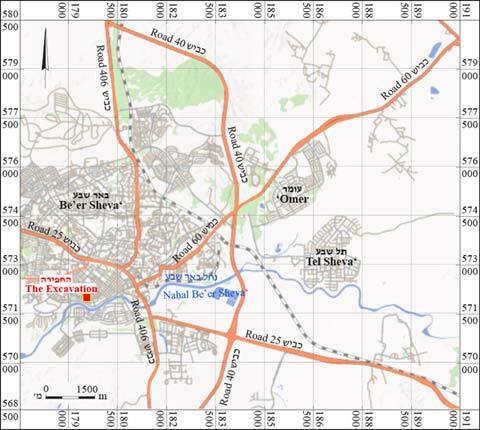 Map of Byzantine graves found in Beʼer Sheva‘. 4. The grave, looking south.